COLE, Carmen and REITER, Lauren (2017) Quality AND Quantity: Preserving the Value of Research Consultations in a High-Enrollment Academic Environment. Paper presented at: IFLA WLIC 2017 – Wrocław, Poland – Libraries. Solidarity. Society. in Session 112 - Poster Sessions. 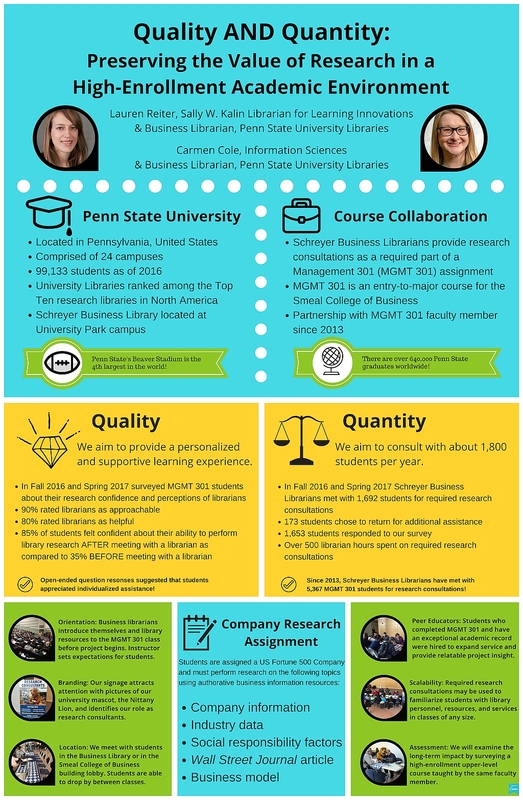 In the most extensive, embedded research consultation effort of its kind in North America, business librarians at a large research institution aim to familiarize all students enrolled in the College of Business with library personnel, resources, and services. Through the ongoing partnership with a cooperative faculty member, business librarians meet with approximately 1,900 students per academic year. 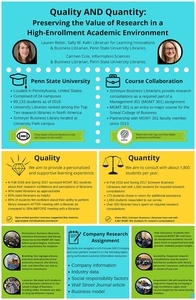 The librarians guide students through the use of authoritative sources in order for the students to complete a detailed company research assignment. This consultative approach provides students with a personalized, supportive learning experience resulting in increased confidence navigating our complicated information environment. The presenters will share a variety of charts and graphs summarizing the substantial qualitative and quantitative data collected to assess the impact of the research consultation service. Photographs will showcase the research consultation setting at the College of Business and highlight student and librarian engagement. Finally, the poster presentation will outline critical components of the project, plans for future assessment initiatives, and best practices for scalable implementation of similar efforts in any academic library setting.